(Nanowerk News) Today, the German Minister for Education and Research, Annette Schavan, officially opens the new training and conference centre for the life sciences on the campus of the European Molecular Biology Laboratory (EMBL) in Heidelberg. 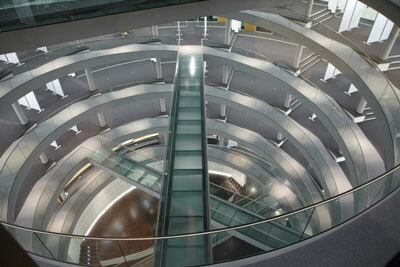 Inside the new EMBL Advanced Training Centre in Heidelberg, Germany. With its auditorium for an audience of 450 people and a large display area for the presentation of scientific posters the EMBL Advanced Training Centre offers unique conditions for scientific conferences and events. For the education of young scientists, the centre offers cutting-edge facilities like teaching laboratories and computer training rooms. In the life sciences, continuous training and scientific exchange are the key to success. Together with conducting excellent basic research and providing cutting-edge infrastructure and services to the scientific community in the member states, advanced training is one of EMBL’s core missions. The extensive expertise of EMBL and its sister organisation, the European Molecular Biology Organization (EMBO), form an ideal basis for the success of the EMBL Advanced Training Centre. The new centre will also benefit from the excellent scientific infrastructure and existing academic, institutional and industrial networks of the Rhine-Neckar region. In the future, industrial partners enrolled in the EMBL Corporate Partnership Programme will also support conferences and events at the institute.